It's hard to know what exactly is going on in North Korea, but it is possible to get glimpses. Seasoned North Korea observer Jean Lee has looked at the evolution of television soap operas in the era of Kim Jong-Un. What gave her the idea? North Korean state media is often known for its bombast and fiery rhetoric. But spend some time watching North Korea’s televised dramas and soap operas, and you may be surprised to see that the country acknowledges some of its weaknesses, too. A group of women gossiping about the new neighbor. A feisty middle schooler using a homemade drone to prank his classmates. A young military officer seeking information from his past. These themes could be from any American TV show. 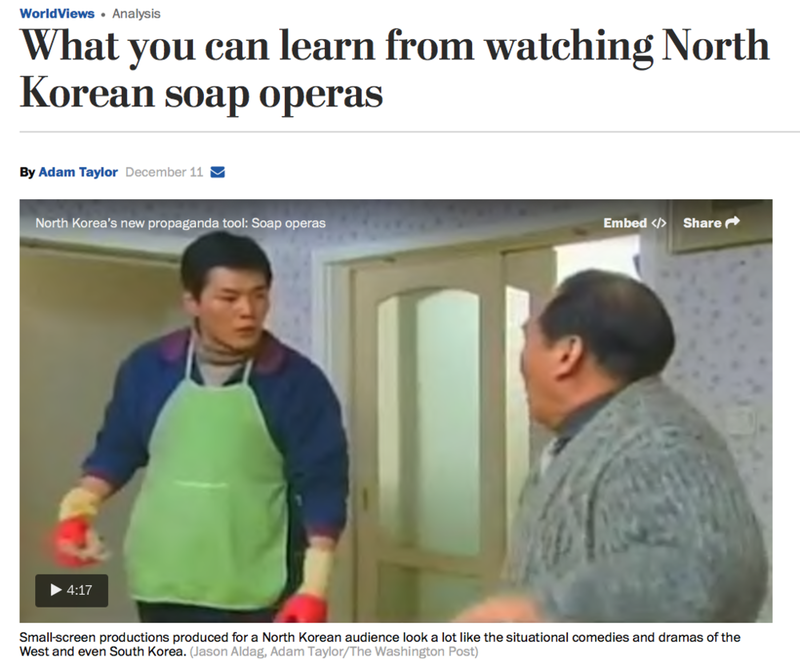 But they are, in fact, storylines from a new wave of soap operas produced by the North Korean state. The Korea Economic Institute of America published today a new analysis by Jean Lee, a journalist and veteran North Korea watcher who opened the AP’s Pyongyang bureau, focused on how North Korean soap operas can shed light on Kim Jong Un’s policy priorities. For her study, Lee analyzed four North Korean TV dramas that aired from 2013 to 2016. She used the dramas to tease out details of what these dramas can tell us about North Korean thinking, and what the regime wants the general populace to focus on in their daily lives. Things like clothing choices, apartment decorations, and career choices that are seen in the dramas shed light on how Kim Jong Un sets domestic priorities in North Korea. In new research, Jean H. Lee described how Kim Jong Un's administration is creating made-for-TV dramas concentrated on youth and technology to appeal to the next generation of North Koreans.